Don't forget to read Part 1 of this post here. The collection of books that Nuremberg widow Katharina Tucher donated to her new convent around 1440 offer a stunning snapshot of one woman’s religious literary interests. Tucher’s books included the sorts of works one would expect to see in the library of a wealthy fifteenth-century reader: prayer books, Henry Suso’s Büchlein der ewigen Weisheit, hagiographies of popular female saints. One particularly noteworthy feature of her collection, however, transcends any one text or genre: the sheer amount of biblical and biblically-derived material. As with the examples in other genres, the Bible-based hymn variations that Tucher included in cod. 2195 matched non-biblical material in her library, in this case, in the same manuscript. They stand out not in their message but in their origin. There are two key points here. First, the biblical material in Tucher’s personal library was useful. From a historiated Bible marked out for reference according to use in the liturgy to framing her sins and successes with the Ten Commandment, Scripture was present as a means rather than an end. Second, much of the Bible’s shadow over her book collection is in fact “biblical material,” rather than full Bibles or narrative equivalents. The distinction of these texts from their non-biblical partners was clear in the Middle Ages as today—the nuns of St. Katherine’s, for example, categorized didactic texts based on the Ten Commandments and other biblical structures (B) immediately after Bibles (A). Biblical material did not necessarily add new teachings to the devotional life of its readers. It did, however, offer a different foundation for those teachings. And as the rising prominence of the Decalogue in moral teaching shows, this particular foundation was more and more important as the fifteenth century progressed. The focus on the “completeness” of the text does not take into account the specific practice of diffusion of the biblical text…often delivered…in the form of passages and pericopes. Moreover, the stress on “complete Bibles” does not fully acknowledge the importance of the connection with the liturgy in the approach of lay people to the biblical text. In fact, the participation in the liturgy and the reading of biblical pericopes following the liturgical calendar…offer the most important and valuable means of access to the Scriptures. To frame lay reading of the Bible as “functional,” as Corbellini et al. describe with respect to liturgical use, indicates an active and conscious engagement with peri-biblical text as Scripture. In this light, Katharina Tucher’s book collection suggests that our understanding of “the vernacular Bible” in the fifteenth century might be broadened even further. The pericope and marked-up historiated Bible in her library were useful. So were her Psalter, moral instruction organized according to the Ten Commandments, and biblical hymns presented as prayer. These texts, in their functionality, also represent an active and conscious engagement with the Bible. Only by studying the many forms of the Bible’s presence in Tucher’s library, therefore, can we begin to understand its place in her spiritual life. I have described her reading interests as “comprehensively typical,” but at the same time, she added biblical material to a miscellany where another scribe omitted it. How “typical,” then, was she? By casting the same wider gaze over biblical material in fifteenth-century literary culture, we can better understand how a lay person interacted with the religious world of their day—a pressing question for Tucher’s era in particular. And indeed, only by accounting for all dimensions of biblical material can we grasp the changing place of the Bible in fifteenth-century religious culture. On Tucher’s use of Christus und die minnende Seele, see most comprehensively Amy Gebauer, ‘Christus und die minnende Seele’: An Analysis of Circulation, Text and Iconography (Wiesbaden: Reichert Verlag, 2010). On the Decalogue’s gradual replacement of the seven deadly sins as the foremost means to teach morality, see Robert Bast, Honor Your Fathers: Catechisms and the Emergence of a Patriarchal Ideology in Germany, 1400-1600 (Leiden: Brill, 1997); John Bossy, “Seven Sins into Ten Commandments,” in Conscience and Casuistry in Early Modern Europe, ed. Edmund Leites (Cambridge: Cambridge University Press, 1988), 214-234. Williams and Williams-Krapp, “Introduction,” 18. Medieval women visionary authors are generally known for their evocative poetry and prose, prophetic missions of reform, and intimate relationship with Christ. Can we imagine a visionary who might be better known for…reading the Bible? Scholars who include Tucher’s personal book collection in their analyses of monastic or lay literary culture have typically focused on three things. First, of course, its unusual size—twenty-six books is the single largest donation to St. Katherine’s by any one person—and her own involvement as scribe of some of those. Second, for two of its most surprising contents. Tucher’s Schwabenspiegel was one of just a handful of non-religious works listed in the convent catalogue. She also brought with her a German translation of William of St. Thierry’s Epistola ad fratres de Monte Dei, a guide to monastic life that includes instruction on how to read for spiritual advancement. While its relevance to her recipients is clear, Tucher’s copy is the only one surviving with definite lay provenance. When it came to longer didactic texts, she owned works like Henry Suso’s Little Book of Eternal Wisdom (plus an additional excerpt from it as an Ars moriendi text), Rudolf Merswin’s Neunfelsenbuch, and Otto von Passau’s Die 24 Alten. Marquard von Lindau, whose importance for late medieval literary culture has recently been illuminated by Stephen Mossman, was a favorite author—Tucher had two copies of his Dekalogstraktat as well as one each of his commentary on Job and teachings on the Eucharist. The hagiographies are well situated in her southern German context: Elisabeth of Hungary, Catherine of Siena, a collection of antique saints from the area around Nuremberg. For the most part, then, Tucher owned books that we might expect a wealthy, devout fifteenth-century woman to own. To focus on categories of genre, however, overlooks one of the most important patterns in her reading interests: regardless of specific texts’ focus, how persistently biblical her overall spiritual and literary orientation were. Looking for Part 2? Find it here. The most comprehensive biographical account of Tucher is found in the introduction to Williams and Williams-Krapp’s critical edition. See Williams and Williams-Krapp, introduction to Die ‘Offenbarungen’ der Katharina Tucher (Tübingen: Max Niemeyer Verlag, 1998), 1-27. On the library of St. Katherine’s, see Marie-Luise Ehrenschwendtner, “A Library Collected by and for the Use of the Nuns: St. Catherins’ Convent, Nuremberg,” in Women and the Book: Assessing the Visual Evidence, ed. Lesley Smith and Jane H.M. Taylor (Toronto: University of Toronto Press, 1996), 123-132. Karin Schneider, “Die Bibliothek des Katharinenklosters in Nürnberg und die städtische Gesellschaft,” in Studien zum städtischen Bildungsgewesen des späten Mittelalters und der frühen Neuzeit, ed. Bernd Moeller et al. (Göttingen: Vandenhoeck & Ruprecht, 1983), 70-82, discusses how Tucher’s selection of books fits in with the convent library overall, and compares her donation to that of other prominent sisters. This was first brought to scholarly attention by Volker Honemann, Die ,Epistola ad fratres de Monte Dei’ des Wilhelm von Saint-Thierry: Lateinische Überlieferung und mittelalterliche Übersetzungen (Zürich: Artemis, 1978), 121, and discussed further in Schneider, 74. Cynthia Cyrus, The Scribes for Women’s Convents in Late Medieval Germany (Toronto: University of Toronto Press, 2009), 112. See, for example, Schneider, 73-75. 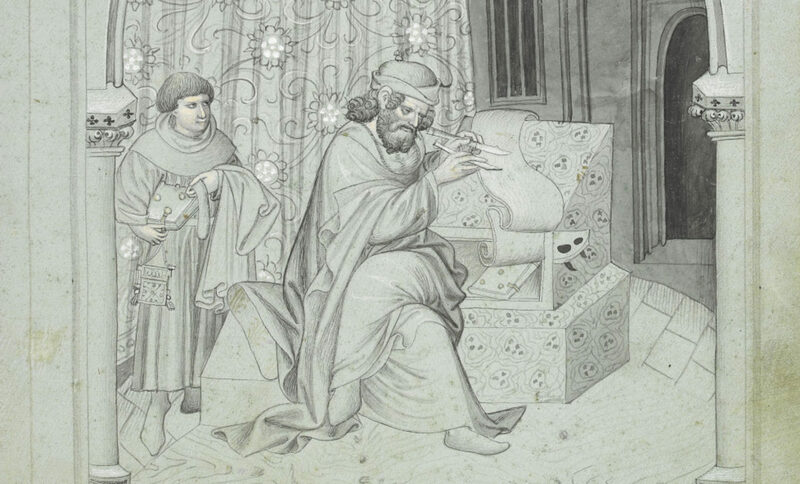 Thomas Lentes, “Prayer Books,” in Transforming the Medieval World: Uses of Pragmatic Literacy in the Middle Ages, ed. Franz-Josef Arlinghaus et al., (Turnhout: Brepols, 2006) 242-243. Sandra Corbellini et al., “Challenging the Paradigms: Holy Writ and Lay Readers in Late Medieval Europe,” Church History and Religious Culture 93 (2013): 171-188. Stephen Mossman, Marquard von Lindau and the Challenges of Religious Life in Late Medieval Germany: The Passion, the Eucharist, and the Virgin Mary (Oxford: Oxford University Press, 2010). As the and papacy and its various offices grew in complexity throughout the Late Middle Ages, a plethora of new religious possibilities opened to non-elites across Western Europe. One such papal office, called the Apostolic Penitentiary, provided the opportunity for common parishioners to have the precious religious privileges that the medieval nobility had fought for two centuries to solidify and perpetuate. The Apostolic Penitentiary granted special dispensation for a variety of religious requests by parishioners across Western Europe, requests beyond the authority of their bishops to grant. Such requests could involve an approval of a marriage that was within four degrees of relationship through blood or marriage, approval for a portable altar so that the petitioner might be able to celebrate mass regardless of location, or an appeal by a supplicant for a new confessor outside of their parish priest. By the fifteenth century, a well-to-do townsperson in Ghent could enjoy many of the same personal religious privileges of the Duke of Burgundy in form, if not in grandeur. As with most supplications, the entry above is heavily abbreviated based on the sheer number of requests the Penitentiary received. It reads: Item Petro van der Ghert de Venrade et Helisabeth eius uxor laici et Gherardo Hermanni de Eyck et Helisabeth Montz eius uxor Leodiensis diocesis petunt litterae confessionalibus fiat de speciali. Datum 16 Maii 1456. Translated: Peter van der Ghert of Venrade and his wife Elisabeth and Gerard Hermanni of Eyck and his wife Elisabeth Montz, laypeople of the diocese of Liege seek letters of confession (the right to choose a new confessor was called litterae confessionalibus). Granted under special papal mandate on the 16th of May 1456. The most important part of this entry for our purposes here is the word laici, whereby the supplication indicates that the two couples from Venrade and Eyck were simple laypeople. They were not nobiles or clerici, nobles or clerics, two common appellations within the Penitentiary registers. All that was needed for a layperson to send a supplicatio from their diocese to the Apostolic Penitentiary was a fee. The exact cost of the fee varied, but it was certainly not prohibitively expensive, as many non-elites are represented in the records of the Penitentiary. Indeed, laici appear to have supplicated far more often to the Apostolic Penitentiary than to the similarly suited office, the Papal Chancery. Transcription: Johannes Boyssel domicellus et perpetuus mareschallus ducatus Limburgen. Leodiensis diocesis. : petit litteras confessions de gratia speciali fiat de speciali D. s. t. 17 Julii 1456. Translation: John Boyssel, young lord and ducal marshal in perpetuity of Limburg, in the diocese of Liege seeks a letter of confession…17th of July 1456. Above we see John Boyssel, who is of a much higher social and political standing than the earlier entry in the supplications above. Boyssel is a perpetuus ducatus mareschallus, or a ducal marshal, and thus a lifetime appointee by either the Duke of Burgundy, or, more likely, the Duke of Limburg to this military position. Such a personage is a particularly striking inclusion in the registers of the Penitentiary. Boyssel’s appointment placed him among secular lords allowed to act in the stead of the dukes themselves. That Boyssel had to go through the same channels as commoners, possibly his own subjects, within the diocese of Liege, speaks to the social leveling effect of the Apostolic Penitentiary. Archivio Segreto Vaticano, Penitenzieria Apostolica, Registrum 6, f. 16v, 28v. Clarke, Peter D. “New evidence of noble and gentry piety in fifteenth-century England and Wales,” Journal of Medieval History 34 (2008): 23-35.